We recently had two break-ins in our neighborhood, one of the houses is our neighbor who left the country for a month. The burglar force-opened the back door, loaded everything of value into the home owner’s car and took off. The car was later found empty and abandoned. The second case is more interesting, the owner was in the house when the break-in happened. The burglar came late in the night (around 3am) and knocked at the door to check if anyone was in. The owner didn’t open the door and went on sleeping. The thieve force-opened the basement emergency window, got into the house but quickly left after realizing the owner was home. Last weekend we had a neighbors meeting and the police officer investigating the case was giving a speech. This blog post is in essence a summary of the tips he gave us on how we can prevent or make it less likely for the incidents like these to happen. Always lock doors and windows - this applies to homes and cars alike. The officer mentioned a recent arrest where a gang of teenagers was doing ‘car hopping’, the kind of crime when they move into a neighborhood and raid cars. They stole things from around 400 cars in a few weeks - none were locked. Don’t leave mail in the mailbox - both break-ins in our neighborhood happened after the owner left mail in the mailbox. A stuffed mailbox is a sign telling the criminal that “the owners are not home”. When on vacation, have neighbors pick up your mail or stop mail delivery at the Post Office (and verify it stopped). Secure sliding doors and windows - in one of the cases of the break-ings in our area, the burglar simply forcibly opened the sliding patio door w/o even having to break the glass. Criminals are looking for easy targets and anything that makes it difficult for them to get into the house will help. The simplest way to reinforce a sliding door is by using a strong wooden dowel or metal rod on the inside. Make use of blinds after sunset - so many times I have walked by a house during night time and saw a family gather by a large screen TV or a guy working on a laptop computer. Without blinds, your house is a fish bowl and it is easy for the fisherman (the criminal) to pick the biggest fish without much effort. Leave a light on when you leave - if you leave during dark hours, leave a light on in one of the rooms, alternate the room. Don’t use the kitchen countertop light for this purpose - according to the officer, too many families are doing it so it now has a different connotation. Consider purchasing a couple light switches on a timer and use them to turn on/off lights when you leave for a long period of time. Light up your house from outside - the best way to do it by installing sensor activated lights on the outside of the house. If possible, install the lights high enough so it is hard for the burglar to just take the light bulb out. Otherwise, buy a motion sensor light bulb socket (available at Amazon for $22.86) and use with your outdoor lights. Make a thorough inventory of your house - if inevitable happens, you want to be ready to give the insurance company complete list of what was stolen (I assume you have insurance). Get out the video camera and take a thorough tour of your home, then store the video in a safe deposit box, or make two copies and leave them at your friends/extended family. 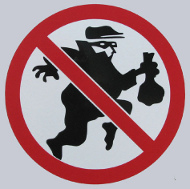 Install visible alarm signs on the outside - even if you don’t plan to install a security system, a “Protected by” sign can be a strong enough deterrent to avoid the burglary. The criminals are looking for an easy target and anything that can make them think twice about breaking into your home is a help. Get yourself a dog - this is probably the most effective way to burglar proof your home but at the same time it is a very subjective tip. You should never get a dog just because you want to keep your home safe. To me a dog is a family friend, but if you think of getting one - consider the side effect of protecting your home as a bonus. Have you had crimes in your neighborhood lately? How do you burglar proof your house?